Fred Walpole : Aquatic Polynesians, 1848. Four years in the Pacific in her Majesty's ship "Collingwood" from 1844 to 1848. Walpole records several examples of the skills in swimming, diving and waterfall sliding on Hawaii and in Somoa. In a brief reference to the Collingwood's arrival at Hilo, he notes that "there were fellows with fowls and turkeys, swimming along on two bits of wood;" these were likely to be surfboards. 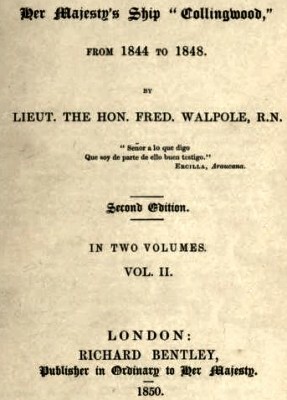 Also note that Fred Walpole is responsible for a unique report of surfboard riding, on the shores of the Meditteranean in 1851. 1851 Fredrick Walpole : Surfboard Riding, Ruad, Syria. three hundred canoes, full of the noisy natives. They came off with fruit, vegetables, fowls, ducks, goats, pigs, turkeys, geese, and green and fresh eatables of all sorts. So, not to the eye only, was the sight fair - our salt-meat-accustomed palates throbbed at the expected feast ; our old tortoise even (a tame one on board) woke out of his sleep, left his corner, and wantoned on the fresh food, till he could eat no more. The excitement among the natives was tremendous : hundreds came merely to look at us ; they had never seen so big a man-of-war, and when asked if certain hours were not enough for visiting, they said, " No ; we can never look enough ; all day and all night are not long enough." The market alongside baffled description : here, a man had swum off with a large live pig ; his legs resting on a pole, and he quite uproarious at the aquatics. There were fellows with fowls and turkeys, swimming along on two bits of wood ; the animals, the very pictures of despair, dropped their heads and wings, and ceased to prune their feathers, far too hopeless for that. Then, the outside people, seeing the rapid sale of those nearer, seized their wares, and dashing over the sides of their canoes, rose at the gangway with their stock-in-trade, pine- apples, cocoa-nuts, guanas, fowls, pigs, goats, all ready for traffic. Everything seems made to swim in this place. One of the greatest attractions was a waterfall, about three hundred yards up the river. It needed not the feats done there to make the fall of the Wailuka, or River of Destruction, worth looking at. A huge rock divided the stream, one half of which dashed petulantly on, and met a noisy fate down the fall ; while the other, of a milder, gentler nature, ran along a channel of solid rock, and fell in one heavy stream a depth of about twenty- five feet, joining the rough waters below. A little turmoil succeeded the junction, then they flowed quietly on, like brothers, arm-in-arm, till they fell again, and soon were lost in the salt waters of the ocean. The great delight of the natives is to go down this fall. They sit in the channel I have described : they utter a shout, a scream of joy, join the hands gracefully over the head, and, one after another, the girls of Hilo descend, emerging like sea-nymphs in the eddy below. The figure, as it gleams for an instant in the body of water, appears, to those standing below, quite perfect, and the gay shouts and laughing taunt to follow, has led to the death of many ; for there is some secret current that not only drowns, but carries away the body too. The feat was attempted by three of our men, but none, I think, did it twice. a false step from the bank. The surprising agility of the women especially, baffles description. One will sit by your side on the high bank, and remain so till you throw a stone into the water, with all your force, then down she jumps, straight as an arrow, her feet crossed, one over the instep of the other, and emerges with a laugh, holding up the stone. On first attempting to rise to the surface after going down the fall, the water seems, from the force of the current, to be matted overhead, and it is only by striking out into the eddy that you can rise ; this the girls manage to perfection. Then the water is clear and blue, not cold, frosty, half-thawed. As lazily one watched the stream, down dropped from the ledges overhead, and but the bright water, what soon reappeared, a man or woman. These ledges are fifty or eighty feet high, yet none seemed to regard it as a feat, and the merry laugh told you it was done but to surprise the European. We appeared contemptible in our own eyes, as we skurried from the rain with our umbrellas; but we soon yielded to wiser teaching, threw care away, got wet and dry again without minding it, swam, and enjoyed it as much as they did. Of bathing the natives are as fond as all other inhabitants of tropical climates, and the beach was a scene of noise, and every sort of aquatic freak ; the clear pools, however, where the rivers deepened into cool baths, they principally loved, and in its transparent depths they would dive and play for hours. The women, here more modest and restrained, bathed apart ; but the boys and men were constantly in the water. The fellows would stand at the edge, and, throwing a sommerset, plop into the water on their backs; taking a heavy stone, they would sink, and sit or lie at the bottom, where, so clear was the pool, each motion was reflected to the looker-on, and each pebble seen as clearly as if no water lay between. In all these feats they are behind no other race : their noble heads emerge somewhat ruflied, but a few shakes in the warm sun, and it rises proud as ever, none the worse, perhaps, for its cleansing. Geoff Cater (2013) : Fred Walpole : Aquatic Polynesians, 1848.